Many people may wonder can bad plastic surgery be fixed? For 33-year-old New Yorker Evan Forster, it was not only cosmetic dissatisfaction but also a significant quality of life issue. Thanks to a broken nose suffered in a football game in 1996, Evan decided to undergo cosmetic surgery in 2000 to straighten his nose and remove the bump on the bridge. On the recommendation of a friend (and with virtually no additional research), he settled on a New York City surgeon and set a date for his surgery. According to Forster, the surgeon failed to bring the pre-op photos they had taken into the operating room as they had discussed. He believes this had something to do with the fact that his aesthetic result was not what they had planned or what he had expected. In the months following his surgery, Evan began to notice a strange and unpleasant odor in his left nostril. When he told his surgeon in a follow-up visit about it, he was told that it was nothing to worry about and was given steroid injections, ostensibly to aid the healing process. Months later, the dedicated athlete began to have trouble breathing through his left nostril, especially when running or engaged in other athletic pursuits. By 2006, his breathing had become an even more serious problem. After Evan’s ordeal, he was quite wary about risking another surgery but felt he had no choice because of the profound effects of his breathing difficulties on his quality of life. This time he did his research and came up with Andrew Jacono, MD, a New York City-based dual board-certified plastic and reconstructive surgeon specializing in facial plastic surgery. In early 2008, he went in to have his severely deviated septum repaired and to fix the unsatisfactory cosmetic result achieved in his first surgery. Four months later, he is happy with the results of his corrective surgery. What’s So Special About Corrective Surgery? The degree of difficulty is greatly increased, due to the presence of scar tissue, altered anatomy (thing just don’t look like they do in the medical books anymore) and often a lack of “material” to work with. For instance, in the case of a woman who came to Dr. Jacono after already having had six separate rhinoplasty procedures, the patient had no cartilage left to work with. Dr. Jacono had to use cartilage from her rib to rebuild her nose. Patients are often emotional about their situation and are quite afraid to undergo another procedure. In some cases, some sort of psychological problem may be present that is causing the patient to seek multiple surgeries. 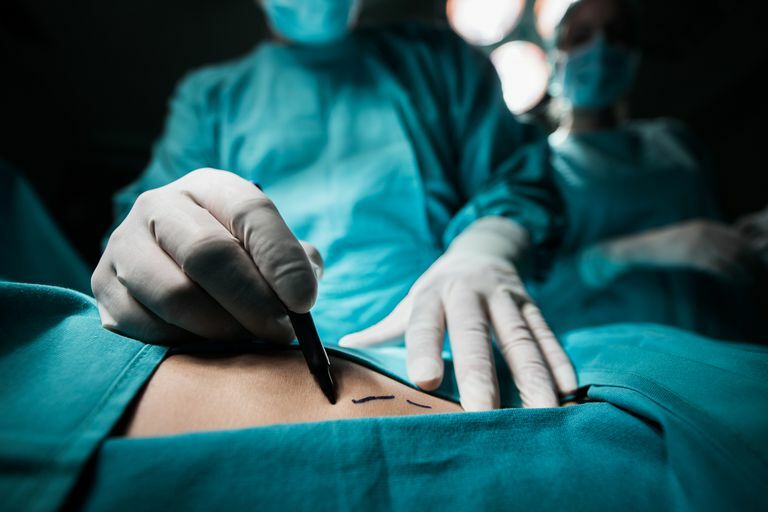 In today’s litigious society, some surgeons are worried about taking on these cases, because it may mean being called to testify in a lawsuit against the original surgeon... or worse. There is also the fear that if the corrective surgery doesn’t go as well as hoped, they may be blamed in part somehow for problems caused by the original surgeon. According to New York City surgeon Matthew Schulman, MD, the procedures that most often require corrective or secondary surgery are body procedures, such as tummy tucks, liposuction, breast lifts and breast reductions (especially those performed overseas). Often, this is due to common complications coupled with poor follow-up, since it would usually be quite inconvenient for the patient to return to an overseas destination to see the surgeon for a visit following surgery. There is also the problem, though, of surgeons being overly aggressive with body procedures by doing too many procedures in one operation. One particularly common problem is with tummy tucks and abdominal liposuction being performed together. If done too aggressively, blood supply to the lower abdomen can be compromised, resulting in poor wound healing or even tissue death. Revision surgery is also relatively common following breast augmentation, often due to poor implant placement, asymmetry or capsular contracture. In Dr. Jacono’s practice, because he specializes in facial plastic surgery, most of his corrective surgery is for botched nose jobs, misplaced chin implants, bad eye lifts and facelifts that have been pulled too tight. Rhinoplasty, in particular, is a procedure for which it is not unusual for a patient to go in for a revision. In this case, Dr. Jacono says that the problem usually has to do with the surgeon just going a bit too far and taking too much off the nose, making it too small and “pinched” in appearance. Some doctors, however, believe that it is a matter of the patient being obsessed with perfect symmetry because the nose is such a central facial feature. The same doctors will probably tell you that since perfect symmetry doesn’t exist in nature, it could be nearly impossible to please these patients 100%. In many ways, the process is the same as for choosing a surgeon for any cosmetic procedure, except that you will probably want to be even more careful. It may also be a good idea to look for a surgeon who specializes in the area you want fixed as well as one who is well-trained in reconstructive surgery. As always, educate yourself as best you can before making a decision. Interview with Andrew Jacono, MD, New York, NY; conducted on 8/5/08. Interview with Matthew Schulman, MD, New York, NY; conducted on 7/31/08. Interview with Evan Forster; conducted on 8/5/08.